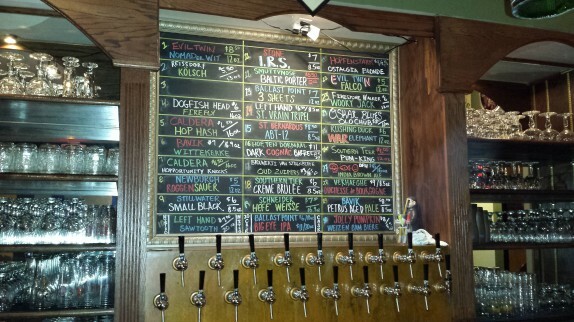 The always rotating beer list and their tap system is very impressive. The lines between the kegs and the taps are chilled in glycol to deliver the perfect temperature out of the tap for each beer. 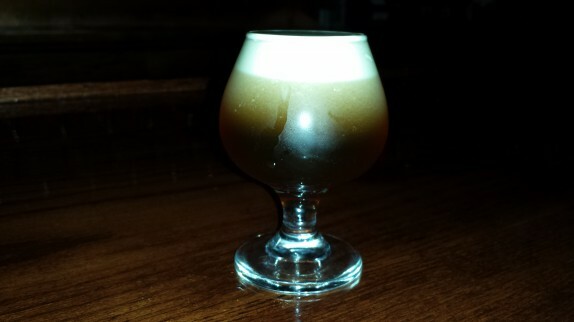 They also have a select beer on what’s called a nitro tap, where a stream of nitrogen is bubbled in along with carbon dioxide as the beer exits the tap; the result is really magical. 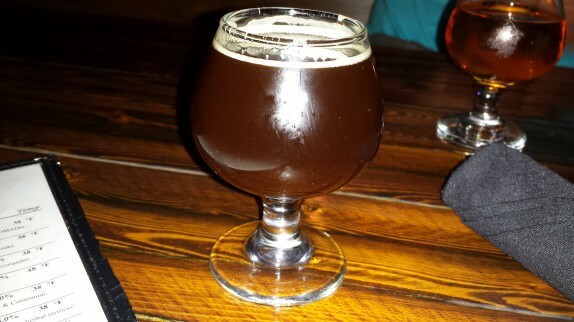 The day I went back for food, they had Sawtooth Ale by Left Hand Brewing Company. It’s an extra special bitter (ESB), which isn’t really my favorite, but I had to try it to see how it played out with the nitro tap, which leaves a very creamy and foamy beer. I know I’m making this sound like it’s a negative thing, but try to think about it like the milk in a cappuccino. It’s almost like it’s whipped up; it’s not negative at all. It’s awesome! Being that I was there to try out their food, I sat down with my buddies, Rory, Brian, and Nick, and we enjoyed some laughs. I had a couple of more tasting size samples of beers. 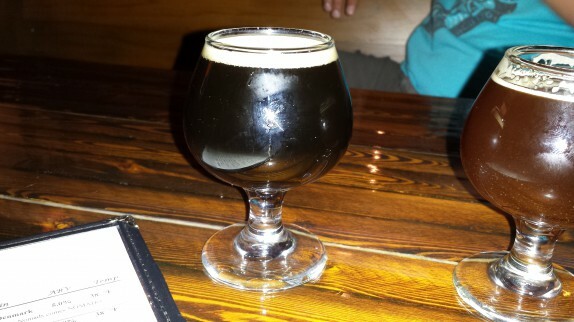 I had no method to which beers I picked; I just wanted a couple of darker beers that day, and I don’t have a whole lot to say about these other than the fact that I enjoyed them. 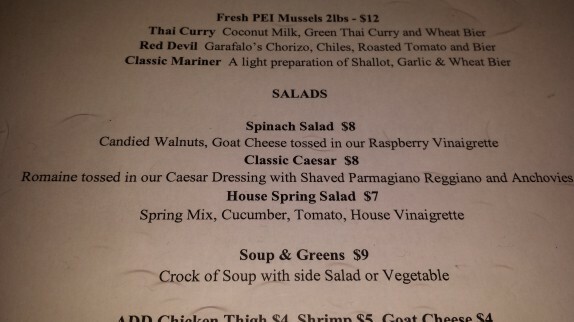 I started my meal with a side portion of the spinach salad on the menu (Candied Walnuts, Goat Cheese tossed in our Raspberry Vinaigrette); the side portion was $5. It was a really good salad. 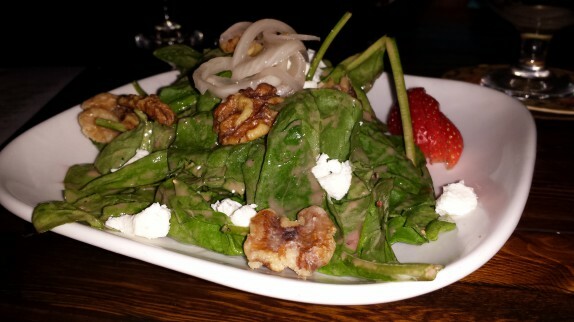 It wasn’t particularly loaded with everything, and salads don’t always have to be. The vinaigrette was light, fruity, and quite sour The creamy goat cheese and crunchy walnuts really helped tame that tang. 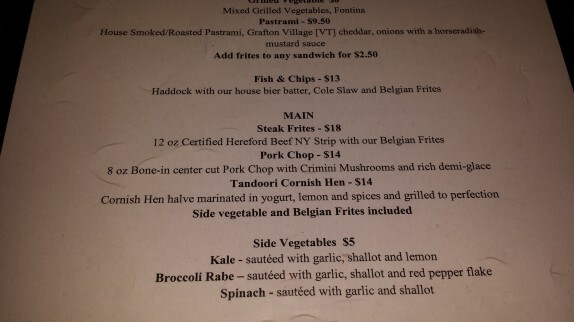 My main course was Steak Frites ($18 – 12 oz Certified Hereford Beef NY Strip with our Belgian Frites). 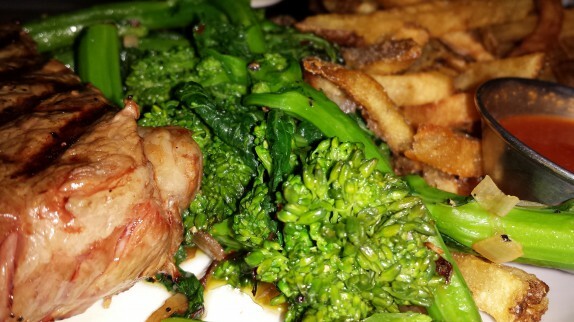 It was a mighty awesome portion, and I was surprised that I also got a side vegetable included (I picked the sauteed broccoli rabe, which was pretty good albeit just a touch overcooked and waterlogged). 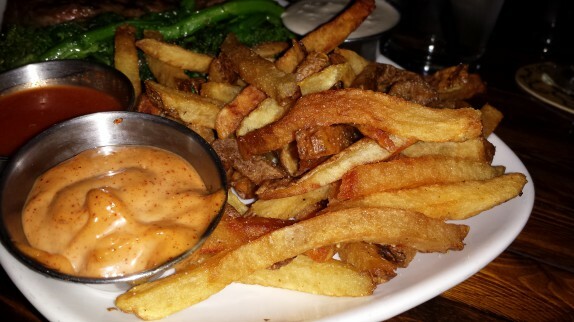 The frites were actually really good and crispy, and that was a big relief. The last thing I wanted was such an amazing pub to have bad frites. 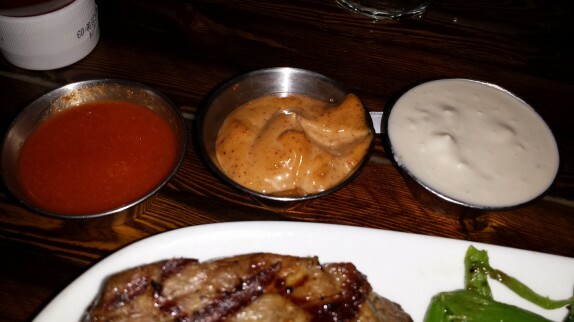 They let you pick two of their dipping sauces, so I opted for Buffalo, Blue cheese, and Ancho mayo (our waitress let me have 3 because she said I was being nice.). 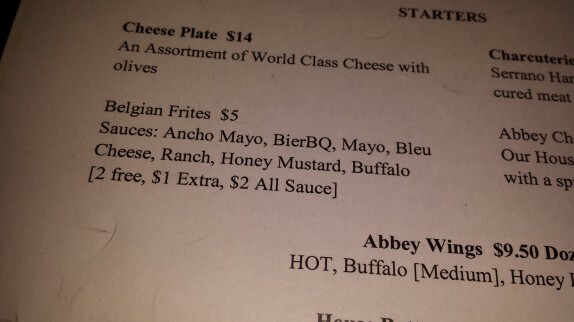 The Buffalo sauce was fairly forgettable, and was probably a bad choice, but the other two were great, the more outstanding being the Ancho mayo, which had the smoky, sweet flavor from Ancho chile with the creaminess of mayo. The steak should have been the star of the plate, but fell pretty flat. It came out cooked to the perfect temperature, but the damn thing had no seasoning. It’s really unfortunate because it was a beautiful steak (Hereford beef frequently is), but was just missing that one step that makes a world of difference between blah and amazing. It was perfectly edible, though. I’m definitely not hung up on this, and I hold the place in very high regard. It’s definitely among the best places I’ve seen in the capital region for someone who enjoys beer, and the food is pretty good too, so it’s definitely worth checking out. Great review!! 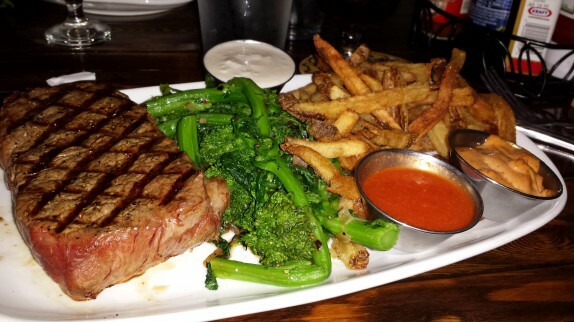 I was curious as to why they would take such care in cooking the steak with perfect grill marks and then dump the broccoli rabe like an after thought on the platter…must have been two cooks working the plate…we have very few restaurants that do the Belgian fries…nice shots! Not only that, but the broccoli rabe is going to weep liquid onto the plate as it cools, leaving one with a bunch of really mushy frites after a few minutes. I would most certainly have asked for a small dish to place the brocolli rabe on.